Not nearly as crowded as the Ridgewood duck pond which is nearby. Parking lot is close by. Picnic tables close to the playground so you could actually picnic near and have your kids play.. 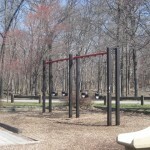 If you have something to say about this park, please comment below! 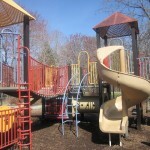 Saddle River County Park is located on East Prospect St, in Glen Rock. 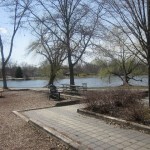 It is in a great location right next to the pond in the center of the park. 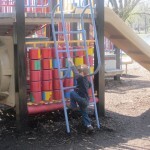 There are two separate structures for each age group and an independent climbing section with repellers and monkey bars. There is no barrier between the playground and the water so you have to keep an eye on the little ones. DIRECTIONS: NJ-17 N to the Century Rd exit toward Paramus. Turn slight right onto Century Rd. Turn right onto Saddle River Rd for approximately 1.3 miles. Entrance to park will be on your right. 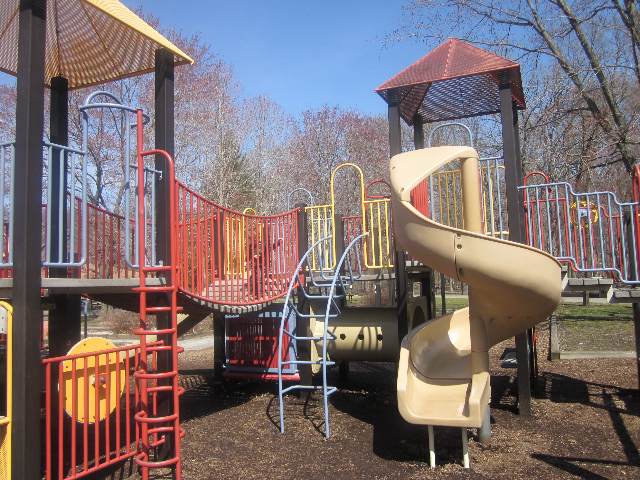 PARKING: Large paved lot close to the playground. PICNICKING: Two gazebo’s with lots of tables. OTHER COOL STUFF: County parks offer walking paths that link local towns together. You can bring rides or roller blades and enjoy the paths that you can take around the town or just stay within the park area. MAKE A DAY OF IT: Stop by Books, Bytes, and Beyond for Young People and pick up a copy of The Playground Guide Best of Bergen County for a friend. 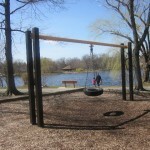 Check out the rest of Saddle River County Park’s playgrounds.